Why Have the Post-April Talks Been Failing? This week’s meeting between Armenia’s and Azerbaijan’s foreign ministers is likely to centre on security issues, including numbers of international observers in Nagorno-Karabakh. But frustration with the peace process will grow unless both foreign ministers address the critical political aspects of a future settlement. Nargiza means “daffodil”. It’s a common name in Azerbaijan and other Muslim cultures, but not in her native Armenia, especially since the start of the three-decade-long conflict with Azerbaijan over Nagorno-Karabakh. As the two country’s foreign ministers prepare for a rare meeting on 18 January, Nargiza’s story is a reminder of how much is spoiled by the collateral damage of three decades of failure to resolve the dispute. Security along the Armenian-Azerbaijani border, and the Line of Contact (LOC) around Nagorno-Karabakh and the adjacent Azerbaijani territories controlled by Armenians, has been precarious since the 1994 ceasefire. Just a handful of Organisation of Security and Cooperation in Europe (OSCE) observers monitor the line, even though this is one of the most heavily militarised regions in the world. The costly and destabilising arms race, aggravated since the early 2000s by Azerbaijan’s oil and gas windfall, has been chiefly facilitated by Moscow, which sells weapons to both Baku and Yerevan. At the same time, Russia co-chairs, together with France and the U.S., the OSCE Minsk Group that steers the conflict settlement process. The downward spiral has grown deadlier since 2014, with increasing use of heavy artillery and renewed fighting in April 2016, which claimed at least 200 lives. That fighting served as a wake-up call and opportunity to galvanise the stagnant peace process. In May and June 2016, President Sargsyan of Armenia and President Aliyev of Azerbaijan agreed on confidence and security building measures (CSBMs) – increasing the number of OSCE observers (likely from the current six to twelve) and creating a mechanism for investigating incidents – and taking forward substantive talks. But they failed to prevent another breakdown in confidence and negotiations in September 2016, when skirmishes broke out again on the conflict divide, and continued until preparations for a new summit began in the summer of 2017. Sargsyan’s and Aliyev’s October 2017 meeting recommitted both to CSBMs and substantive talks. There is refreshed hope that diplomacy can prevent a new escalation, which in the worst case could provoke a regional conflagration, given Armenia’s and Azerbaijan’s respective defence and strategic partnership and mutual support agreements with Russia and Turkey. But there is also a risk that meetings, if unproductive, will lead to a renewed sense of frustration with diplomacy, and a temptation to view the use of force as a legitimate means to solve the conflict. People living near the divide are highly vulnerable, both now and in the event of a renewed escalation. For this to be avoided, progress has to be made on security while political discussions need to resume. But as in many conflicts, security and politics hold each other hostage. The Armenian side insists on CSBMs before the substance of a future settlement can be discussed. “Who would discuss settlement while we are being shot at?”, an Armenian politician said to Crisis Group. Azerbaijanis, for their part, have been reluctant to commit to CSBMs that would risk cementing the status quo, without discussions on the content of a future deal. The 18 January meeting between the Armenian and Azerbaijani foreign ministers will discuss an increase of the number of OSCE observers, according to diplomats close to the peace process. The sides are still at odds on modalities. Baku would at most like to see a light-touch arrangement with no change in the current offices, whereas Yerevan prefers a more hands-on arrangement, including new personnel with new duties. In Nagorno-Karabakh, sources told Crisis Group they seek a permanent OSCE field presence in heavily populated parts of the Line of Contact. Although it is a tall order for a dozen unarmed staff to monitor the full length of the line, and the impact of their presence on overall security may be limited, an increase in numbers would be a small breakthrough in a process that often struggles to secure as much as a date for the next meeting between the sides. The other CSBM on the table, an investigative mechanism, is far less likely to be agreed, diplomats say. In Nargiza’s village, Nerkin Karmiraghbyur, on the international Armenia-Azerbaijan border well to the north of Nagorno-Karabakh, nobody has been killed or injured recently, but the climate of fear is common along the length of the conflict divide. In Armenia’s Tavush region, humanitarian agencies and local government have raised walls around the perimeter of schools and kindergartens to shield children from small arms fire. The local administration has built a bypass road – its exposed segments reinforced by a stone wall – to protect cars travelling between border villages. People move their beds away from windows exposed to the other side and Nargiza’s railway coach shop has old bullet holes in it. In Nagorno-Karabakh itself, 7,000 of the region’s current 150,000-strong population live within 15km of the divide. Hundreds of thousands more people, many of them displaced by fighting in the 1990s, live similarly close to the line on the Azerbaijani side, where an incident in July 2017 killed an elderly Azerbaijani woman and her two-year-old granddaughter. People living near the divide are highly vulnerable, both now and in the event of a renewed escalation. Humanitarian aid workers are making contingency plans, and take a view that resumed fighting would have little regard for civilian lives. The political aspects of a future settlement, based on mutual concessions, will have to be addressed with international security arrangements to guarantee them. In order to prevent such a scenario, a discussion on security alone is insufficient. The political aspects of a future settlement, based on mutual concessions, will have to be addressed with international security arrangements to guarantee them. A possible road map to an even-handed settlement was developed a decade ago in the Basic Principles, which outlines principles for a settlement, including: return of the territories surrounding Nagorno-Karabakh to Azerbaijani control; an interim status for Nagorno-Karabakh providing security and self-government guarantees; a corridor linking Armenia to Nagorno-Karabakh; future determination of Nagorno-Karabakh’s final status through a legally binding expression of will; the right of return of Internally Displaced Persons (IDPs) and refugees; and international security guarantees, including a peacekeeping operation. The principles continue to be accepted by both sides as the general umbrella for a settlement. In practice, they are shunned by people in both societies whose lives over the past quarter-century have developed around the conflict, and whose intractable discourses are in large part fuelled by their leaderships. As long as both leaders envision a settlement on their own terms only, security and politics will keep each other hostage. And men and women like Nargiza, on both sides of the divide, will remain in peril. A year after Nagorno-Karabakh’s April 2016 violent flare-up, Armenia and Azerbaijan are closer to war than at any point since the 1994 ceasefire. Political and security conditions that prompted the April 2016 escalation have become more acute and both sides claim a new wave of escalation already has begun. Since mid-January 2017, deadly incidents involving the use of heavy artillery and anti-tank weapons have occurred with varying degrees of intensity; May saw a significant increase, including reports of self-guided rockets and missiles used near densely populated areas along the Line of Contact (LoC), the heavily militarised area that divides the Armenian and Azerbaijani sides since the 1994 ceasefire. The settlement process has stalled, making the use of force tempting, at least for tactical purposes; today, both sides – backed by mobilised constituencies – appear ready for confrontation. These tensions could develop into larger-scale conflict, leading to significant civilian casualties and possibly prompting the main regional powers to intervene. Russia, France and the U.S. need to put their differences aside and apply concerted high-level pressure on the parties to unlock the current paralysis and mitigate risks of renewed violence. This results from an opportunity lost. In the wake of the April 2016 escalation, which claimed at least 200 lives and swept both societies in a frenzy of pro-war sentiment, a new opening presented itself for the conflict settlement process led by the Organisation for Security and Cooperation in Europe (OSCE)’s Minsk Group, co-chaired by the U.S., Russia and France. Although two meetings were held between the Armenian and Azerbaijani presidents in May and June 2016, they produced no tangible result. Instead, since late summer 2016, escalation has ebbed and flowed, claiming dozens of lives. The heads of state have refused calls to restart negotiations, preferring to visit the “front line” and issue threatening public statements. The past year has exposed the fragility of conflict settlement efforts, now caught in a standoff. Armenia – concerned about Nagorno-Karabakh’s security and angered by Baku’s increased assertiveness – insists on a lowering of security risks before substantive talks can start. Azerbaijan – frustrated with the longstanding status quo and concerned that additional security measures could further cement it – insists substantive discussions cannot be delayed. In their May and June 2016 talks, the two presidents agreed in principle to strengthen peace monitoring and introduce an investigative mechanism to lower tensions, while committing to substantive talks to address key sticking points in the settlement process. Although these were left unspecified, they would have to include returning some Armenian-controlled lands in the conflict zone to Azerbaijan’s direct control, and addressing the status of the rest of the Armenian-populated disputed area as well as security arrangements in the whole conflict region. So far, there has been neither monitoring, nor an investigative mechanism, nor substantive talks. Armenia and Azerbaijan’s leaders view each other with deep mutual distrust, unable to acknowledge each other’s interests. Effective channels of communication – whether between them, their respective governments, or military commanders in the conflict zone – are non-existent. The result is a standstill in which any incident is liable to spiral out of control, especially given the shared view in both societies that another conflict is inevitable, and that a “final solution” to the Nagorno-Karabakh problem is necessary, even if it means a new war. Basic principles of any viable settlement are well known: variants of a land-for-status formula coupled with strong international security guarantees. But these are predicated on mutual concessions that neither party shows any interest in making. Instead, positions have hardened since April 2016. Baku has become more assertive in emphasising the legal basis of its claims, seeking international acknowledgement that its territories have been annexed and suggesting Western sanctions should be imposed; it also is trying to restrict international actors’ engagement with Nagorno-Karabakh, imposing restrictions on economic activity in, or visits to the region. It simultaneously is applying greater force to pressure the Armenian side. For its part, Armenia says it will respond in kind. In the worsening security environment, it has shown no appetite for discussions to unblock the current stalemate, and has launched a new “nation-army” program likely to further increase war rhetoric and societal militarisation. De facto Nagorno-Karabakh has even declared its readiness, if attacked, to advance deeper into Azerbaijan’s densely populated territory along the Line of Contact to gain a new security belt and strengthen its hand in future negotiations. As tensions rise, international mediation stagnates. Russia remains the most influential foreign player, yet its role is complex. It is prima inter pares in the Minsk Group, but also chief arms supplier to Azerbaijan and Armenia, both of whom suspect Russia is more interested in expanding its influence in the region than in resolving the conflict. Only when it cannot do enough alone is Russia prepared to share responsibility with the other OSCE Minsk Group co-chairs, France and the U.S., but Paris and Washington have been pre-occupied with domestic political transitions. Neither Baku nor Yerevan trust Russia, the Minsk Group, or the broader international system. [S]uspicion of Russian motivations – in Baku, Yerevan and elsewhere – remains high. But diplomatic paralysis would be too risky and costly, and time for effective mediation is running out. In light of growing threats of confrontation, the mediators’ primary task should be to resume regular communication between Armenian and Azerbaijani leaders and insist that Yerevan and Baku soften positions that have calcified over the past 23 years as well as tone down martial rhetoric that fuels their publics’ belligerence. They should more pointedly describe to these publics the risks and costs of escalation. And they should push Yerevan and Baku to agree to immediate measures to restore confidence and security, including: increasing the number of OSCE personnel to monitor the conflict zone; establishing an OSCE-led investigative mechanism to hold the two sides accountable, while introducing a degree of transparency regarding their military arrangements in the conflict zone; and establishing regular contacts between their respective field-based militaries. In parallel, Armenia and Azerbaijan should launch substantive discussions on outstanding issues, including the return to Baku’s control of territories adjacent to the former Nagorno-Karabakh Autonomous Oblast, Nagorno-Karabakh’s status, international security arrangements, and return of displaced persons. Moving in that direction will require Russia, the U.S. and France to iron out their differences, work in unison and overcome Baku’s and Yerevan’s distrust. Russia bears special responsibility given its role and the suspicions both sides nurture regarding what motivates Moscow. To assuage concern about the prospect of Russian peacekeepers in the conflict zone, for example, Moscow could invite all OSCE Minsk Group members to explore options for a future multinational peacekeeping force. Likewise, it also could provide additional transparency on its arms sales to Armenia and Azerbaijan. With their leaderships’ buy-in, the three co-chair countries need to insist that Yerevan and Baku revise their positions. That won’t be easy. Both the U.S. and France recently have gone through complicated political transitions, and suspicion of Russian motivations – in Baku, Yerevan and elsewhere – remains high. But diplomatic paralysis would be too risky and costly, and time for effective mediation is running out. Even as mediators reiterate the longstanding mantra that there is no military solution to the Nagorno-Karabakh (NK) conflict, both Armenia and Azerbaijan have been seized with a renewed appetite for conflict in the wake of the April 2016 escalation. Bellicose sentiment on the ground is rising, seriously limiting space for compromise. This report analyses the current military, political, social and diplomatic aspects of the conflict. The next section outlines risks – both humanitarian and in terms of regional spillover – surrounding the possible renewal of active conflict. The third section describes post-April 2016 developments and radical changes in the public mood in all three societies affected by the conflict. The fourth section lays out reasons for the failure of attempts since April 2016 to negotiate a de-escalation of the conflict and broader arrangements for peace. The relative stability in the Nagorno-Karabakh conflict zone experienced for nearly two decades since the 1994 ceasefire began to significantly deterioriate in 2014. But the April 2016 four day escalation, during which Azerbaijan gained control of two strategically important pieces of land in Nagorno-Karabakh, was a watershed. [fn]For more details of the April escalation, please, see Crisis Group Europe Report N°239, Nagorno-Karabakh: New Opening, or More Peril?, 4 July 2016.Hide Footnote Since then, the danger of large-scale confrontation has been constant. Evidence from both sides suggests that a new wave of escalation already has begun and is accelerating along the Line of Contact. Since mid-January 2017, intense exchange of fire has resumed, with the use of not only small arms, but also grenade launchers and anti-tank missiles. With warmer weather come opportunities to test tactics, including military sorties in the dense mountainous forests and use of heavier military equipment along the region’s valleys. Since the April 2016 escalation, the Armenian side has been refurbishing trench structures, and both Armenia and Azerbaijan have procured new weapons and improved surveillance and communication systems. Both sides see summer-autumn 2017 as a critical period during which the enemy could intensify military actions. The Armenian side cites elevated expectations among the Azerbaijani public coupled with Baku’s assertion that it imminentely wants to reestablish control over Nagorno-Karabakh. [fn]In the conflict settlement process, de facto Nagorno-Karabakh is represented by Armenian officials. The de facto Nagorno-Karabakh leadership has voiced its full support to Armenia’s government in the settlement process. This report will refer to the “Armenian side” when discussing the settlement process and negotiating positions. It will refer to the societies of Azerbaijan, Armenia and Nagorno-Karabakh when discussing public processes.Hide Footnote Azerbaijan warns that – at the very least – Yerevan might consider provoking a conflict in order to regain control over the two strategic heights lost in April 2016. Leaders refuse to meet and channels for official and even ad hoc exchange between the parties’ military commanders have been missing for years. [fn]During the Vienna meeting between the presidents in May 2016, according to President Sargsyan, Armenia was ready to agree to a meeting of the two countries’ militaries only after an increase in the number of OSCE monitors and introduction of an incident-investigative mechanism. See https://youtu.be/lXlgNPANWps. It is unclear whether Azerbaijan was ready to give a green light to regular meetings on a military level.Hide Footnote In an atmosphere of deep mistrust and no dialogue, the sides could misread each other’s intentions, interpreting activity along the front line as an attempt to launch a larger-scale operation. Signs of danger loom. Since the April escalation, the Armenian side has strengthened its positions along the Line of Contact and reinforced its military personnel; these actions have bolstered local military forces’ confidence in their ability to counter any attack. Likewise, it has installed video and thermal imaging cameras along Armenian positions, thereby reducing the likelihood of an unexpected Azerbaijani attack. Toward the end of the winter, an internal consensus emerged within the de facto Nagorno-Karabakh leadership that – in the event of an Azerbaijani attack – the Armenian side should not only defend their positions, but also attempt to advance deeper into Azerbaijan. [fn]Crisis Group interview, officials, military and politicians, Nagorno-Karabakh, February 2017.Hide Footnote Preliminary planning by Nagorno-Karabakh-based military suggests advancing 15km beyond the established Line of Contact, which, they believe, would force the enemy to abandon hostilities, or at a minimum establish a new buffer zone that could break the enemy’s will to conduct regular attacks and become a new negotiating bargaining tool. Meanwhile, Azerbaijan’s success in the April 2016 escalation cemented confidence in the army and reinforced hopes that Baku could regain control of at least some territory through military means. Since then, Azerbaijan has been further increasing its expenditures on weapons and professionalised its army;[fn]In 2015, Azerbaijan spent $3 billion on its military, a 165 per cent rise compared to 2006. President Aliyev boasted that Azerbaijan’s defence budget was bigger than Armenia’s national budget. Crisis Group Report, Nagorno-Karabakh: New Opening, or More Peril?, op. cit., p. 11.Hide Footnote over the past years, it has continued to procure heavy weaponry and military equipment, mainly from Russia but also Israel, Pakistan, Turkey and other countries. [fn]85 per cent of Azerbaijan’s arms imports came from Russia according to Stockholm International Peace Research Institute’s “Trends in World Military Expenditure, 2015”, April 2016. Crisis Group interviews, officials, analysts, Baku, March 2017.Hide Footnote Azerbaijan’s army was quick to build new subterranean trenches along the two strategic heights seized during the April escalation, giving it a notable tactical advantage in the event of a larger escalation. [fn]Crisis Group interviews in Baku in March 2017 and de facto NK in February and May 2017.Hide Footnote The positions it acquired north-east of the Line of Contact in April 2016 ensure Azerbaijan’s control over the village of Talish, previously the biggest settlement in the area, giving it a strategic vantage point over the mountainous gorge leading into Nagorno-Karabakh’s densely Armenian-populated Martakert region. Similarly, the southern positions it gained on the Lalatapa mountain provide it with a strategic vantage point over Nagorno-Karabakh’s south and parts of the south east, including the Armenian-populated areas of Hadrud and Martuni. A full-scale war is in neither Armenia’s nor Azerbaijan’s interests. Both sides possess ballistic missiles with which they could target significant civilian, economic and military infrastructure deep inside each other’s territory. [fn]Sergey Minasyan, “Deterrence in the Karabakh Conflict”, Caucasus Institute, 2016, pp. 110-116.Hide Footnote Both sides seem to recognise broader dangers should such escalation occur: engagement of two major regional powers, Russia and Turkey, which have treaties with, respectively, Armenia and Azerbaijan. [fn]According to their 2010 Agreement on Strategic Partnership and Mutual Support, Baku and Ankara are to support each other in case of aggression against either of them. Armenia is the only South Caucasus country that is a member of the Collective Security Treaty Organisation (CSTO), a Russian-led military alliance of six former Soviet republics. On a bilateral level Armenia and Russia have the Treaty of Friendship, Cooperation and Mutual Aid of 1997, updated in 2010, which evokes military cooperation in case of foreign attack and threat to territorial integrity and sovereignty. Crisis Group Report, Nagorno-Karabakh: New Opening, or More Peril?, op. cit., p. 3.Hide Footnote However, this mutual deterrence does not preclude more limited military operations aiming to seize control over new territories which, in turn, could spiral out of control and lead to the outbreak of a larger regional war. There are other, limited, constraints. Both sides regularly share online video clips of incidents along their front-line positions, anticipating use of such material to demonstrate who launched the first strike. [fn]Videos can be found on the official YouTube channels of Azerbaijan’s (at https://www.youtube.com/channel/UCp9m21a2rI1_0DItLvHcuCw) and de facto NK’s defence ministries (at https://www.youtube.com/user/TheNkrArmyChannel/videos).Hide Footnote In the short term, this could deter the parties, neither of whom wishes to be held responsible for the outbreak of war. [fn]After the 2008 war with Russia, Georgian authorities used excerpts of intercepted phone calls registering reported movement of Russian military vehicles into South Ossetia, to cast doubt on the emerging narrative in the West that Georgia was to blame for starting the war.Hide Footnote But the evidence, such as it is, would not be independently obtained and thus likely would be seriously questioned by outside actors and the other party, given the heavy use of propaganda materials by both sides. Much of Nagorno-Karabakh is inhospitable terrain for military operations. The Armenian side controls its mountainous, densely-forested interior and the north, which is protected naturally by the Murovdag mountain range. [fn]Aleksandr Golts, “Обострение конфликта в Нагорном Карабахе – поражение России” [Escalation of Nagorno-Karabakh conflict – Russian defeat], Snob (https://snob.ru), 5 April 2016.Hide Footnote As a result, military action can take place only along the remaining 150-km segment of the Line of Contact that stretches from the Martakert district to the Iranian border. The map above details the conflict zone. 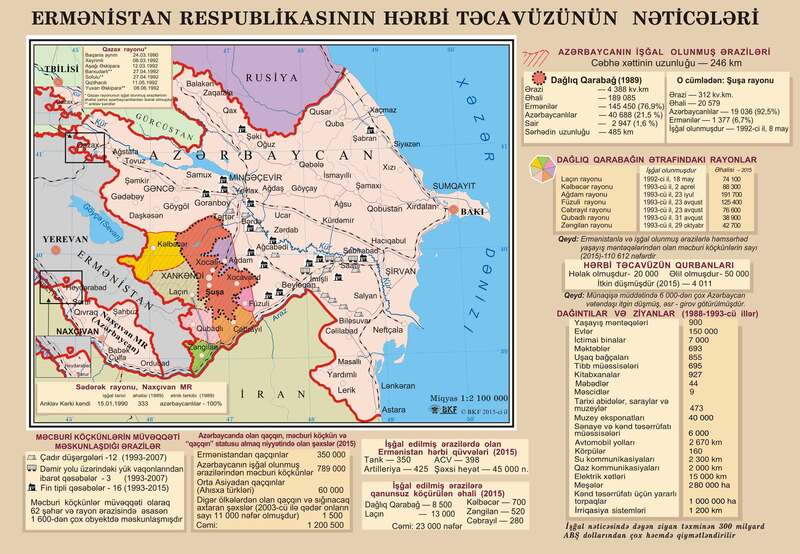 Since the 1992-1994 war, the Armenian side has controlled the territory of the former Nagorno-Karabakh Autonomous Oblast and seven adjacent Azerbaijani districts – five in full (Jabrail, Zangilan, Gubadli, Lachin and Kelbajar) and two in part (Agdam and Fizuli). Most Azerbaijani IDPs come from Agdam and Fizuli districts, making up 40 per cent of the total displaced population, according to Azerbaijani official sources. In the event of escalation, remote combat likely will be combined where feasible with use of infantry and heavy military equipment and potentially air force support, dragging the parties into a broader conflict with much larger military and civilian losses. Armenian experts recognise Azerbaijan’s clear technical and quantitative advantage in weaponry and equipment. [fn]Sergey Minasyan, “Deterrence in the Karabakh Conflict”, Caucasus Institute, 2016, pp. 118-121.Hide Footnote Some Azerbaijani experts assert they also have a quantitative advantage in troop numbers. An increasingly important variable in the eyes of these experts is Azerbaijan’s demographic advantage. [fn]Crisis Group interviews, Baku, March 2017.Hide Footnote Its population has boomed over the past decade and currently outnumbers that of Armenia and Nagorno-Karabakh roughly four-to-five fold. On the other hand, Armenian experts point to their side’s familiarity with the territory where ground combat most likely would take place. It has built up its fortified positions in Nagorno-Karabakh over years, including cobweb entrenchments that in certain areas extend for hundreds of metres. A range of hills along approximately half of the 150-km north-eastern section of the Line of Contact would make it difficult for Azerbaijani forces to advance infantry forward. The Armenian side, of course, would face similar obstacles in regaining lost territory. Circumstances differ around the central and south-eastern sections of the Line of Contact, which are strategically important to both sides. These locations stretch along a valley, making it easier to use heavy military equipment. Main roads linking Armenian settlements in the northern and southern parts of Nagorno-Karabakh pass through the valley, which also offers access to the city of Agdam, destroyed during the war in the 1990s, and the capital of de facto Nagorno-Karabakh, Stepanakert. Yet despite these apparent advantages, this valley constitutes Azerbaijan’s most vulnerable point along the Line of Contact due to the presence of densely populated Azerbaijani villages directly behind its positions. Although Armenian and Azerbaijani troops are separated by about 100-200 metres in this location, exchange of fire is far less frequent than at other points along the Line of Contact. From Armenian trench fortifications, one could make out the roof tops of local houses and hear the sound of a tractor during an early 2017 visit. Any confrontation along this corridor would lead to serious losses among Azerbaijan’s civilian population. An increase in military activity inevitably would provoke serious civilian casualties and displacement. Located within the 15-km zone in which the Armenian side likely would advance in the event of an escalation are densely populated settlements of ethnic Azerbaijanis. Armenian sources calculate some 600,000 ethnic Azerbaijani inhabitants would be forced to leave their homes, while Azerbaijani sources estimate about 300,000. [fn]Crisis Group interview, high-level de facto official, Stepanakert, February 2017. Regions of Beylagan, Aghjabadi, Barda, Goygol and Goranboy as well as Naftalan city are located roughly within 15-25km of the closest point of the Line of Contact.Hide Footnote Azerbaijan also notes the presence of energy infrastructure close to the Line of Contact,[fn]The Baku-Tbilisi-Ceyhan (BTC) oil pipeline passes several dozen kilometres north of the Line of Contact.Hide Footnote which might be targeted should an escalation occur. [fn]Crisis Group interviews, diplomats, Baku, Brussels, spring 2017. In April 2016, Armenian media quoted sources in the de facto NK Defence Ministry suggesting they would seek to harm Azerbaijan oil and gas infrastructure. “Карабах готов нанести удар по нефтяным коммуникациям Азербайджана”, Newsarmenia.am (http://newsarmenia.am), 5 April 2016.Hide Footnote Likewise, about 7,000 ethnic Armenians live within a zone extending 15 km from the Line of Contact into Nagorno-Karabakh,[fn]Crisis Group interview, de facto official, Stepanakert, February 2017.Hide Footnote most in the nothern part which also hosts the Sarsang water reservoir, essential to the region’s agriculture and mining businesses. A prolonged military assault with heavy military equipment could allow Azerbaijan to strike deep into the region, including targets in Stepanakert. Diplomats note that significant civilian casualties and reports of atrocities could prompt external intervention, notably on the part of Russia, which arguably could invoke them as justification. International diplomatic and humanitarian actors worry that if large-scale violence restarts, neither party is likely to protect civilians or prevent ethnic cleansing and other war crimes. [fn]Crisis Group interviews, representatives of international organisations and diplomats, Yerevan, Baku and Tbilisi, spring 2017.Hide Footnote In November 2016, the European Court of Human Rights (ECHR) communicated one case each against Armenia and Azerbaijan related to atrocities committed during the four days of conflict, requesting information from the two governments. [fn]See “T.M. and Others v. Armenia and 4 other applications”, 25 November 2016, and “K.S. and N.A. v. Azerbaijan and 21 other applications”, 25 November 2016, European Court of Human Rights (http://hudoc.echr.coe.int). These incidents include the brutal killing of three elderly ethnic Armenian residents in the village of Talish.Hide Footnote The de facto Nagorno-Karabakh ombudsman also documented several violent incidents involving Azerbaijani soldiers committing atrocities against Armenian military recruits. [fn]See de facto ombudsman’s detailed report. “Artsakh Ombudsman’s Second Interim Report on Atrocities Committed by Azerbaijan during the 2016 April War”, at http://www.ombudsnkr.am/en/docs/Report_PUBLIC.pdf.Hide Footnote Online videos and photographs depict an Azerbaijani soldier displaying the head of an Armenian soldier to several ethnic Azerbaijani villagers. [fn]The videos filmed on a mobile phone were pubished on social media but later removed. The de facto authorities shared copies with Crisis Group.Hide Footnote Similar atrocities are cited in the appeal to ECHR against Armenia, including mutilation of bodies of Azerbaijani soldiers killed during the April 2016 escalation.[fn]“T.M. and Others v. Armenia and 4 other applications”, op. cit.Hide Footnote None of these claims appears to have been investigated and remain unpunished. The April 2016 flare-up led to the most significant conflict-related shift in political and public life in Azerbaijan, Armenia and de facto Nagorno-Karabakh since the end of the 1992-1994 war. The four-day escalation prompted an enormous rise in patriotic feeling on all sides, solidifying demands for a “final solution” to a conflict that has smouldered for two decades. While Azerbaijani society was buoyed by victory, Armenia went through a period of despondency that, at least in part, shaped the outcome of elections that set the country’s political direction for years to come. Nagorno-Karabakh society, for whom the escalation revived painful wartime memories, witnessed some of the most far-reaching internal changes, with political and economic development projects now sidelined in favour of renewed focus on military strengthening. The generation that fled the 1990s conflict feels responsibility toward their children, fearing they ‘will not know what Karabakh was’. Armenian society sank into despondency after the April escalation, losing trust in its leadership’s ability to protect Nagorno-Karabakh’s territory or population. The April flare-up, particularly the leadership’s failure to mount an adequate military response, got the election year off to a difficult start in Armenia, which is in the process of transforming its semi-presidential system into a parliamentary republic. [fn]This followed a 2015 constitutional referendum; the process of transition began with the April 2017 parliamentary elections and will be completed by spring 2018 with presidential elections.Hide Footnote The government’s capacity to make unpopular concessions in Nagorno-Karabakh negotiations will be even more constrained during this significant constitutional transition. Growing dissatisfaction came to the surface in July 2016 during a violent incident in which a group of disgruntled Nagorno-Karabakh war veterans known as “Sasna Tsrer” stormed a Yerevan police station to demand the president’s resignation, killing two police officers and taking hostages. Calls for more pragmatic and compromise-oriented approaches to conflict settlement have been marginal, and broadly rejected by most of the population. Levon Ter-Petrosyan, Armenia’s first post-independence president and now an opposition member, was the only politician to criticise the government for past failures in handling the negotiation process. In December 2016, he called for return of territories adjacent to the former Nagorno-Karabakh Autonomous Oblast (NKAO) to Baku’s control in order to avoid war. [fn]In December 2016, Ter-Petrosyan described his vision at a meeting of his Armenian National Congress (ANC), see https://www.youtube.com/watch?v=o7OuHuYpNfQ&t=1s.Hide Footnote His party only gained 3 per cent of public support – the lowest ever result for Ter-Petrosyan and his party. The April escalation marked a turning point in Nagorno-Karabakh. Although closely linked with Armenian society, Nagorno-Karabakh’s ethnic Armenian population remains a relatively isolated and distinct community, whose identity has been shaped by its experience as a society under siege. It spent much of the last decade developing its economy, bolstering its institution, and rebuilding towns and villages with military, financial and political support from Yerevan as well as assistance from the Armenian diaspora. But the April 2016 escalation interrupted these efforts, and caused a shift in financial resources toward military purposes. Armenian and de facto Armenian-Karabakh military forces are intertwined, with Armenia providing all logistical and financial support, as well as ammunition and other types of military equipment. [fn]Both Armenia’s and the de facto Nagorno-Karabakh’s leaderships used to strongly deny any close integration between the two structures. This changed after April 2016. In January 2017, a high-level military official from Armenia confirmed to Crisis Group the existence of close cooperation as well as Armenia’s support and control of Nagorno-Karabakh-based military troops; he added that this also was confirmed by the 2015 European Court of Human Rights ruling in “Chigarov and others v Armenia”, which found Armenia responsible for military operations inside Nagorno-Karabakh. See http://hudoc.echr.coe.int/eng?i=001-155353.Hide Footnote After the April escalation, and for the first time in two decades, the local Nagorno-Karabakh leadership acted on its own initiative to refurbish military positions located along the Line of Contact. [fn]In interviews with Crisis Group, military officials based in Armenia and Nagorno-Karabakh said this process still was backed and closely monitored by Armenia’s Joint Staff, although they were led and managed by the de facto authorities.Hide Footnote Foreign donations, collected by ethnic Armenian diaspora representatives and channelled directly to the de facto leadership, were diverted exclusively to the local defence agency. [fn]The de facto government announced that $11 billion had been raised via foreign donations and exclusively spent on the local army. See “The special account of receipts and expenditures report, 2017”, Government of Nagorno-Karabakh Republic Information Centre, 2 January 2017 at http://gov.nkr.am/en/official-news/item/2017/02/02/infograph/.Hide Footnote Some additional funds came from the local budget. [fn]The budget of the de facto government is financed in part by transfers from Armenia; it also enjoys its own revenues, which make up around 40 per cent of local budgets since 2005. Crisis Group interviews, de facto officials, Stepanakert, February 2017.Hide Footnote Authorities constructed alternative roads and tunnels near military positions and installed thermal imagers and night-vision equipment along the Line of Contact to improve front-line surveillance. They also modernised the military’s internal communications system, deepened and reinforced trenches in some locations with additional protective covers, and generally tried to improve infrastructure. IV. Why Have the Post-April Talks Been Failing? By clarifying the risks and costs of renewed conflict, the clashes should have spurred the parties to cooperate; indeed, Azerbaijan arguably hoped the limited escalation would galvanise the international community and pressure Armenia to engage. [fn]Crisis Group interviews, diplomats and foreign analysts, Yerevan, January 2017, Baku, March 2017.Hide Footnote But events unfolded differently. Despite two meetings in the months following the escalation, the presidents – burdened by mutual mistrust – were unable to reach any agreement; negotiations deadlocked after a public spat in September. On both sides, public opinion appears increasingly entrenched and uncompromising, providing leaders with scant leeway to negotiate. Mutual concessions that might benefit the two countries in the longer term could in the shorter run threaten internal stability and thus ruling elites. For now, the only scenarios seemingly under discussion are military solutions or the tactical use of force to gain advantage at the negotiating table. Both sides also mistrust international mediators, perceived as guided by the interests of major powers and unable to ensure the region’s long-term security and stable development. The two presidents have demanded that all OSCE Minsk Group co-chairs assume a more proactive mediation role, including by issuing public statements that do not equate the two parties, but rather criticise the other side’s shortcomings and assign responsibility, be it for security incidents (in the case of Azerbaijan) or lack of progress in the talks (in the case of Armenia). Three main issues have been on the negotiating table since the end of the war in the 1990s: the fate of the seven districts around the former Nagorno-Karabakh Autonomous Oblast (NKAO); the status of the remaining territory in the conflict zone, now populated predominantly by ethnic Armenians; and the international security measures necessary to support the return to stability and security within the conflict zone. [fn]See Philip Remler, “Chained to the Caucasus: Peacemaking in Karabakh 1987-2012”, International Peace Institute, 6 January 2016.Hide Footnote Settlement of these questions would provide a foundation for further advances in the negotiating process, including return of IDPs, but presumes compromise and mutual concessions. Armenians living in Nagorno-Karabakh, too, express a clear view: these lands, which they fought for and won, should remain under their control. [fn]Crisis Group interviews, Nagorno-Karabakh region, October 2016, February 2017.Hide Footnote In particular, the eleven thousand people who (according to local sources) inhabit what arguably are the two most strategic districts – Kelbajar and Lachin – consider them home. [fn]The Armenian name for Kelbajar is Karvachar. Crisis Group interviews, district residents, Yerevan, October 2016; Kelbajar, May 2017. These unverified numbers were provided by local residents.Hide Footnote They chiefly are post-war settlers from Armenia as well as ethnic-Armenian IDPs from neighbouring regions that remained under Azerbaijan’s control after the war. The de facto authorities signed long-term land rent contracts with the local population, who have turned lands in most adjacent areas into farms and will pay annual taxes for the next two decades. [fn]Crisis Group interviews, residents, Nagorno-Karabakh, October 2016, February and May 2017.Hide Footnote These long-term arrangements suggest neither the authorities nor the settlers view this as a temporary status or are contemplating return of the districts to Baku’s control. The past decade has seen developments regarding interpretations and application of principles of self-determination and territorial integrity. The West’s recognition of Kosovo’s independence was followed by Russia’s unilateral recognition of Abkhazia and South Ossetia, and in 2014, its annexation of Crimea. These events sharply divided major world powers. They have particular resonance in post-Soviet conflicts. [B]oth sides view negotiations as a zero-sum game in which risk-taking can spell defeat, further stymying even incremental progress. Polarisation between the two sides does not merely complicate international mediation, it also reflects declining trust in that mediation. The fates of Kosovo, Abkhazia and South Ossetia, as well as Crimea weigh heavily, impacting on perceptions of possible security arrangements, but also shaking broader confidence that the parties can count on an international system with sound legal underpinnings. Indeed, both believe the international community has been inconsistent vis-à-vis self-determination and territorial integrity claims, reinforcing Yerevan’s and Baku’s desire to maintain stability by relying on their own means. Both sides are convinced that international mediators cannot provide firm guarantees to safeguard the agreements they want Armenia and Azerbaijan to conclude. Aliyev repeatedly has spoken about the shortcomings of international law, which failed to compel Armenia to return the seven regions the UN Security Council itself deemed occupied. [fn]See UNSC Resolutions 822, 853, 874 and 884. See also statements by President Ilham Aliyev in Tartar in December 2016, “Speech by Ilham Aliyev at the meeting with representatives of the general public in Tartar”, op. cit.Hide Footnote Armenia, similarly, blames the international community for failing to respond to Azerbaijan’s policy of isolation toward de facto Nagorno-Karabakh. The Minsk Group’s lowest common denominator, “passive mediator” approach places the co-chairs in a weak position, particularly vis-à-vis parties entrenched in maximalist positions. Changing the current dynamic requires high-level backing from Moscow, Washington and Paris coupled with close coordination. That combination appears unlikely at least in the near future, given uncertain political transitions in France and the U.S. President Macron, with time, might well intensify France’s involvement on this issue. President Trump, for now, remains a genuine question mark. Russia has been the dominant international player in the Nagorno-Karabakh conflict for the last ten years. It has been the only global power publicly presenting proposals to the Armenian and Azerbaijan leaderships and reacting instantly to changes in the conflict zone. [fn]Crisis Group Report, Nagorno-Karabakh: New Opening, or More Peril?, op. cit.Hide Footnote More recently, Moscow has used its privileged position to promote its own initiatives, though often acting on behalf of the OSCE Minsk Group, thereby boosting their legitimacy and political weight. A central actor, Russia also is one whose motivations raise questions both in Yerevan and Baku. Neither side views Moscow as disinterested; both view it as using the conflict to advance its position and military presence in the South Caucasus, an area it considers to be within what Russian officials typically describe as the country’s “sphere of privileged interests”. Moscow is seen as courting Armenia or Azerbaijan alternately, depending on which is more willing or able to bolster its regional goals. These include safeguarding its borders, including the problematic North Caucasus, and preventing an uptick in military activity close to Syria, where it is deeply engaged. As a result, Armenia and Azerbaijan question Russia’s interest in resolving the conflict and criticise its overly transactional approach. [fn]Crisis Group interviews, Baku, Yerevan, Brussels, Vienna, 2016 and 2017.Hide Footnote Notwithstanding their concern, the absence of proactive Western participation has left the two parties with no real alternative to Russian mediation. [T]the absence of proactive Western participation has left the two parties with no real alternative to Russian mediation. As Yerevan and Baku see it and informally admit, Russia is chiefly interested in expanding its military presence in the region by deploying troops in the conflict zone. Azerbaijan expressed satisfaction with Russia’s apparent new position, but it was short-lived. President Aliyev welcomed Russia’s readiness to “put pressure” on Armenia and between the April confrontation and mid-summer 2016 repeatedly said he anticipated immediate changes in the stalled process. These hopes dissipated as Azerbaijan concluded that Russia was again willing “to play the two sides so as to keep pressure on both”. [fn]“Speech by Ilham Aliyev at the military unit in Tartar district”, op. cit. Crisis Group interviews, analysts, Baku, March 2017.Hide Footnote After meeting with his Armenian counterpart in August 2016, Vladimir Putin said: “We need to find such approaches and mechanisms, whereby … no one would feel that they are the victorious or the defeated party”. [fn]“High-level Armenian-Russian negotiations took place in Moscow”, Official website of the President of Armenia, 10 August 2016, http://bit.ly/2qASl1s.Hide Footnote Azerbaijan had had higher hopes. While violence remains at a relatively low boil, any escalation quickly could spin out of control, and the danger of more deadly fighting involving highly destructive weaponry is real. Failure to contain a future escalation likely would result in heavy casualties coupled with foreign intervention. Troop deployment from any of the regional powers would deeply impact Armenia and Azerbaijan, and their sovereignty, at a time when both have just celebrated 25 years of independence. Negotiations are the only way out of the impasse, and the best way to avert another war. Sound principles for a realistic, fair settlement of the conflict exist, but distrust, a gap between the mediators’ and the two sides’ perceptions, and the protagonists’ heightened appetite for maximum gains likely render any immediate compromise formula remote. For both sides, either stalemate or war currently appears a better outcome than compromise. Worse, Baku’s frustration with the status quo on the ground, and Armenia’s efforts to cement it, could prompt a vicious cycle of further and more violent confrontation. Baku’s frustration with the status quo on the ground, and Armenia’s efforts to cement it, could prompt a vicious cycle of further and more violent confrontation. Implementation of the CSBMs discussed in Vienna and St. Petersburg – enhancing monitoring of the zone of conflict and setting up an investigative mechanism – is urgently needed and should be accompanied by establishment of a channel of communication between field-based militaries on both sides. But this needs to happen in parallel to substantive discussions of issues central to the settlement. The problem is that both sides see no reason to proceed with the element of the twin approach they disfavour: Yerevan will not agree to substantive discussions until CSBMs are addressed; Baku will balk at implementation of confidence-building measures without at least some dialogue on substantive issues. This is where high-level coordination and pressure by Moscow, Washington and Paris is both needed and possible – if they put their differences on other issues aside. The best prospect for averting renewed war is for Russia, the U.S. and France to work in unison, with strong buy-ins from their respective leaderships. As they do so, they also should press Armenian and Azerbaijani leaders to tone down hostile rhetoric, soften their negotiating positions and acknowledge – privately, but also publicly – that this conflict ultimately will only be resolved through negotiations, not by force. Stepanakert is the capital of the former Nagorno-Karabakh Autonomous Oblast and the non-recognised Nagorno-Karabakh Republic. The Azerbaijanis have officially renamed the city Khankendi and refer to it by this name. This report uses the pre-1988 names for all geographical features in the area of conflict.